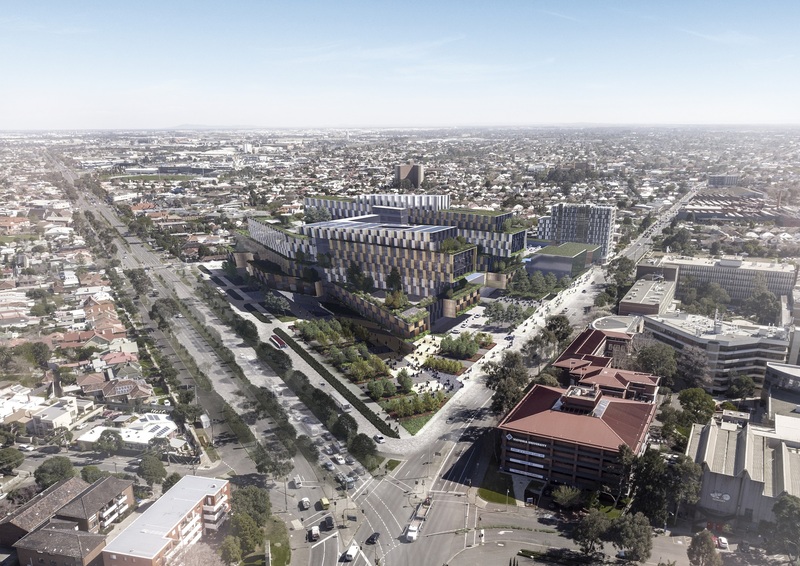 Open-air car parks opposite Victoria University's Footscray Park campus have been selected as the site for the new Footscray Hospital with the Andrews Government today making the announcement that if they're re-elected, construction will commence in 2020. The May budget allocated a sum of money to purchase the land required for the new hospital and today it was announced the new facility will have 504 beds, a number well up on the current facility's capacity of 290 beds at the Gordon Street site. Spring Street says the new facility will allow 15,000 more people to be treated per annum with a further 20,000 emergency admissions also possible. The state government also says there will be an expansion of specialist facilities with a focus on mental health care expansion as well. Reports from December 2017 suggested that Victoria University will also invest in a redevelopment of its Footscray Park campus to the tune of $300 million in order to establish a new 'College of Health and Biomedicine'. Other reports similarly referred to the new hospital site also including a private hospital. The state government statement only focuses on a new public hospital for Footscray. Despite having seven universities with major campuses in Melbourne, only three offer medicine courses at Monash University (Clayton), The University of Melbourne (Parkville) and Deakin University's School of Medicine based at its Waurn Ponds campus on the outskirts of Geelong. Western Health operates Footscray Hospital, as well as Sunshine Hospital, Williamstown Hospital and Sunbury Day Hospital, will operate the new currently under construction Joan Kirner Women's and Children's hospital adjacent to Sunshine Hospital. The existing Footscray Hospital site on Gordon is co-located with Western Private and should the new public hospital be built at the corner of Geelong and Ballarat Roads in Footscray Park, the existing site is likely to gain interest from parties interested in redeveloping the site. The proposed new site of the Footscray Hospital, the existing site and the nearby Kennards redevelopment zone are all linked into Footscray station by the 82 Moonee Ponds-Footscray tram.